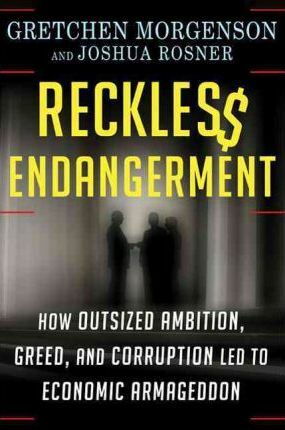 In "Reckless Endangerment", Gretchen Morgenson, the star business columnist of "The New York Times", exposes how the watchdogs who were supposed to protect the country from financial harm were actually complicit in the actions that finally blew up the American economy. Drawing on previously untapped sources and building on original research from co-author Joshua Rosner - who himself raised early warnings with the public and investors, and kept detailed records - Morgenson connects the dots that led to this fiasco. Morgenson and Rosner draw back the curtain on Fannie Mae, the mortgage-finance giant that grew, with the support of the Clinton administration, through the 1990s, becoming a major opponent of government oversight even as it was benefiting from public subsidies. They expose the role played not only by Fannie Mae executives but also by enablers at Countrywide Financial, Goldman Sachs, the Federal Reserve, HUD, Congress, the FDIC, and the biggest players on Wall Street, to show how greed, aggression, and fear led countless officials to ignore warning signs of an imminent disaster. Gretchen Morgenson is a national treasure. Year after year, she has dragged Wall Street miscreants out of the shadows, exposing their dirty secrets to the public that they bamboozled with schemes and deceits. Now, working with Joshua Rosner, she has trained her expert eye on the mortgage mess that pushed the American economy to the brink. In stunning detail, Morgenson exposes the truth behind the worst financial calamity of modern times, weaving a tale that is as mesmerizing as it is horrifying. "Reckless Endangerment" names the names and reveals the secrets of the plutocrats and politicians whose greed and recklessness threatened the foundations of capitalism. It is essential reading for anyone struggling to understand how America entered the new era of financial chaos. "Kurt Eichenwald, New York Times bestselling author of Conspiracy of Fools and The Informant" Even before "Reckless Endangerment, "Gretchen Morgenson was my nominee for Reporter of the Decade for her forensic and prophetic coverage of Wall Street. Now, she and the equally talented sleuth Joshua Rosner, like Holmes and Dr. Watson, have pieced together the clues to a seminal mystery of the financial debacle: how American taxpayers were suckered by the shenanigans, greed, egos, back scratching, and guile of financial and political elites who swarmed like vultures around Fannie Mae, picking it clean of oversight and accountability while its executives gorged themselves on the spoils. Naming names and taking no prisoners, they drill deep into one of the most disturbing scandals of our time, perpetrated in the name of helping "the little guy." Read it and weep. Read it and vow" Never Again"! "Bill Moyers, journalist, and President, Schumann Media Center" Morgenson and Rosner have written the long-awaited volume that gets to the heart of the mortgage crisis. The fearlessness and breadth of reporting make the book as compellingly readable as it is exhaustive. "Reckless Endangerment" is a remarkable achievement--and should be required reading for all Americans. "Bryan Burrough, Vanity Fair special correspondent and bestselling author of Barbarians at the Gate and The Big Rich" Gretchen Morgenson and Josh Rosner show us how, over the last fifteen years, the mortgage lending industry used money and political influence to escape regulation, enrich itself, and create a catastrophe. Particularly in its dissection of Fannie Mae, Freddie Mac, and their enablers, this book is unmatched in its depth and invaluable to anyone interested in the causes and lessons of the financial crisis. "Charles Ferguson, Academy award-winning director of Inside Job" A chilling account of the reckless disregard for ethical or civilized values at the heart of our financial system. If this compelling history does not completely turn your stomach, that's good - because by bailing out these individuals, their attitudes, and their way of life, we have set ourselves up for another nauseating turn of the Financial Wheel. "Simon Johnson, co-author of 13 Bankers: The Wall Street Takeover and The Next Financial Meltdown""
Gretchen Morgenson is a business reporter and columnist at "The" "New York Times," where she also serves as assistant business and financial editor. She was awarded the Pulitzer Prize in 2002 for her "trenchant and incisive" coverage of Wall Street. Prior to joining the "Times" in 1998, she worked as a broker at Dean Witter in the 1980s, and as a reporter at "Forbes," "Worth," and "Money "magazines. She lives with her husband and son in New York City.Joshua Rosner is a managing director at the independent research consultancy Graham Fisher and Co. and was among the first analysts to identify accounting problems at the government-sponsored-enterprises and to warn of the coming credit crisis. He advises regulators and institutional investors on housing and mortgage-finance-related issues. He lives in New York City.